Beautiful, Quiet Condo Overlooking Golf Course. Centrally located. Monthly rates available for January, February and March. Minutes From Cal Ripken camp. All new HD Smart TV in living room and HD TV's both bedrooms. Located In Myrtle Beach On Rt. 17, With Golf Courses, Shopping Malls And Plenty Of Restaurants Within Minutes. Easy Access to the Beach Which Is About One Mile Away. 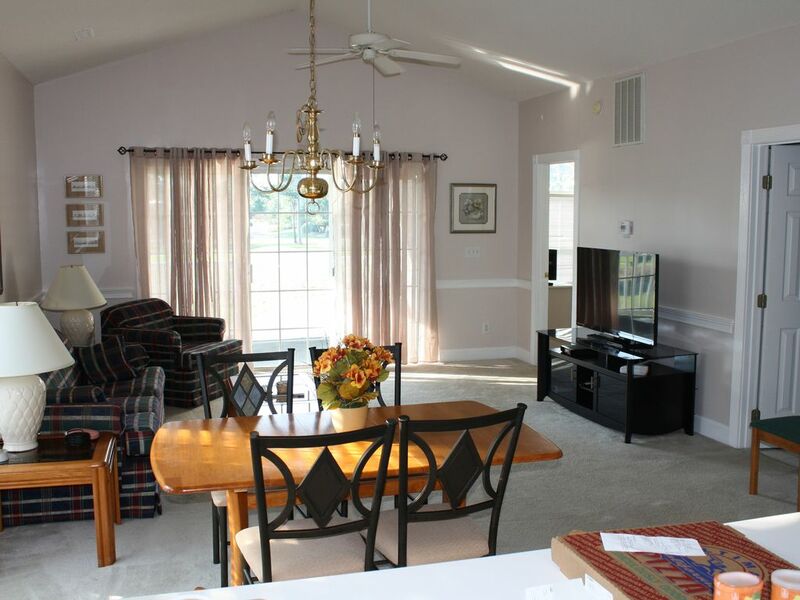 The Condo Is Located On The Third Floor With A Balcony Overlooking A Par Three On The Golf Course. Vaulted Ceilings And Being On An End Of The Building, With Plenty Of Windows, Gives This Condo A Great Feeling Of Openness And Sunshine. Only About One Mile From Broadway On The Beach And About 5 Minutes From The Airport Makes This A Great Spot To Stay. There Are Many Golf Courses Located All Around The Condo Including 2 Which Are Part Of Myrtlewood Villas. There Are Two Bedrooms, with new mattresses. Each bedroom can be made into one king size bed or two twin size beds.Two Full Bathrooms, Washer-Dryer And A Pull Out Couch, Queen Size, So You Can Sleep 6. TV’s In Both Bedrooms and DVD Player For Rainy Days. WiFi available in condo. The minimum age to rent the condo is 21. New AC unit, very effective in warm weather. Outdoor pool just around the corner from our building. Great location near the attractions! The property was clean and had all the amendities of home. The only down side is that the unit was on the 3rd floor. Taking luggage upstairs was back breaking. We really enjoyed our beach vacation and it was really because of the unit. The unit was located about a mile from the beach but it was literally a straight shot. The unit is located near everything. You do need a car but everything was within 5 miles. The unit was nice. We weren't happy with the cleanliness but it was minor. There is a washer/dryer in the unit so we rewashed all of the linen. We also choose to hand wash the dishes. But again, that was minor. Overall we had a great stay and if we were to vacation in Myrtle Beach again we would love to stay in the unit again. I am glad you had a good time. Very nice condo. Beautiful view of the golf course. Office staff are helpful and informative. Plenty of parking. Rates also available for individual days during week or weekend. Rates will be quoted upon request. Rates also available for monthly rental for Jan., Feb. and Mar.. Please call.